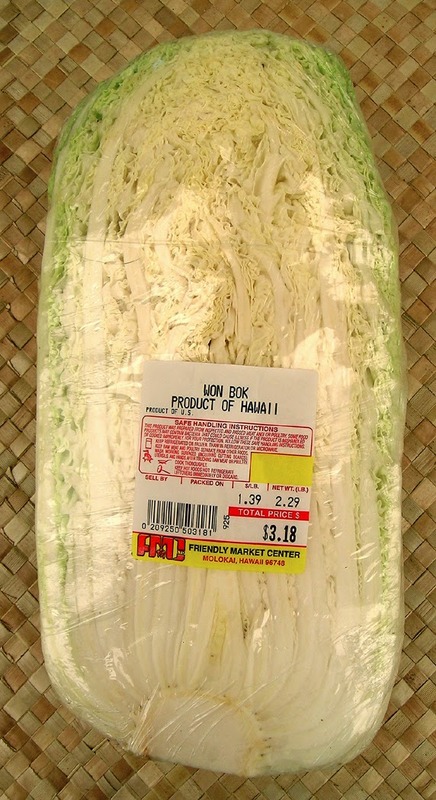 Napa, or celery cabbage in Hawaii is referred to as "won bok", where it is very popular in Korean baechu kimchi. Won bok is a type of Chinese cabbage originating near the Beijing region of China, and is widely used in East Asian cuisine. It is a more delicate variety of cabbage than the round heads of cabbage. Here in Hawaii, won bok is grown in cooler-climate areas like Waimea on the Big Island. I love to use this crunchy cabbage in salads because it is fluffy and lightly crisp, and doesn't wilt as quickly as lettuce, with salad dressing on it. It also holds up well in soups, stews, stir fries, lettuce wraps, and braised dishes. Put cabbage in large bowl. Add celery, green peppers, red peppers, pineapple, pecans, salt, pepper and herbs. Mix yogurt, sour cream and milk together until consistency of heavy cream. Pour over salad right before serving. Makes 6 servings. Reserve 8 cabbage leaves. Shred remaining cabbage to measure 2 cups. Combine soy sauce and next 3 ingredients (through cornstarch). Cut pork crosswise into 1/4-inch-thick slices. Stack several slices vertically; slice pork into 1/4-inch-thick pieces. Repeat procedure with remaining pork. Add pork, carrots, and mushrooms to soy sauce mixture; toss. Heat a large skillet over medium-high heat. Add 1 tablespoon oil. Add 1/4 cup onions; sauté 30 seconds. Add shredded cabbage and water; sauté 2 minutes. Remove cabbage mixture from pan. Add remaining 1 tablespoon oil. Add remaining 1/2 cup onions and garlic; sauté 30 seconds. Add pork mixture; sauté 3 minutes or until done. Add cabbage mixture; toss. Place about 1/3 cup pork mixture into each of 8 reserved cabbage leaves. Makes 8 servings. This is a wonderful stir-fry. If you gather all of your ingredients ahead of time, this will prove to be a very quick meal to cook, and will satisfy your guests. Combine first 7 ingredients in a small bowl; stir to combine. Heat a wok or large skillet over high heat. Add oils to pan; swirl to coat. Add shrimp; stir-fry 1 minute. Add ginger and garlic; stir-fry 30 seconds. Add broth mixture to pan; bring to a boil. Cook 2 minutes or until mixture thickens. Stir in cabbage, snow peas, and red bell pepper; cook 2 minutes. Top with green onions. Serve with white rice garnished with sesame seeds. Makes 2 large servings, or 4 small servings. Ichiyazuki is a salt pickling process, and is the easiest, fastest and most popular way of pickling in Japan. Basically, vegetables (cucumbers, young radish leaves, mizuna, mustards, turnips and leaves, etc.) are washed, sliced, salted and placed under a weight for about a day. You may prepare this in the morning and serve pickles at dinner. Raisins or chilies may be added for desired flavor. Salt is rinsed off the vegetable before serving. The vegetables are good for only 1-2 days. Wash won bok leaves. Sprinkle salt on leaves and massage salt into leaves (especially white mid ribs). Place nappa leaves in a deep pan or bowl. For sweet or hot flavoring, add raisins or chilies on the side of the leaves. Sprinkle salt on top of the nappa. Place a dish that will be able to sink down and place it on top of the nappa. Put a heavy weight on top of the plate. Another pan filled with water placed on top of the plate may be used as weight. When you are ready to eat the pickles, wash the leaves and squeeze out the water. Cut leaves into 1/2" lengths. Cut cabbage into quarters and then into 1-inch square pieces. Throw out the core. Put cabbage into large nonreactive bowl and toss with salt. Let cabbage sit for a couple hours at room temp. Add all the water, making sure cabbage is covered. Cover and brine at room temp overnight. Drain the cabbage, rinse it out, and squeeze away any excess moisture. In a large mixing bowl, combine cabbage and mix with garlic, ginger, fish sauce, vinegar, sugar, Sriracha, onions, and carrot. Cover and store at room temp. Check the flavor every few days until you get the fermented flavor you like. Once it's ready, store in an airtight container in your refrigerator. Kim Chee has a rotted odor, when cooking with it, expect the aroma to linger. Heat a wok till the surface is almost smoking. Then add the oil and spread it around till it coats the surface evenly. Temporarily move the wok off the heat and add the garlic, then stir for about 10 seconds. This is to prevent the garlic from burning. Then the pork, move the wok back to the high heat, add two pinches of salt and pepper and toss around for 2 or 3 minutes. Add kim chee and stir-fry 3 minutes. Add the rice to the pan, crumbling any big sticky blocks with your hands to ensure they're all separate, then toss well until heated through. Then add fish sauce or light soy sauce. Stir the mixture around again for another minute. Then taste the rice to check saltiness. Put fried rice, packed in a cereal bowl. To serve, invert the bowl on a plate and top with a fried egg and chopped green onion for garnish. Makes 4 servings. Note: With any fried rice, the rice should be prepared drier than usual. You can't make fried rice with freshly cooked rice. You need to start with boiled or steamed long grain white rice. The best rice to use is leftover long grain rice that's been lying in the fridge for at least a day. This will turn the grains firm and get rid of the excess moisture. They will also be much easier to separate. If you cook with freshly-made rice, all you will get is "fried mush" instead of fried rice. If you can't wait a day, at least let the rice cool for a few hours in an airy spot. Also, if the wok is not hot enough, your rice grains will start sticking everywhere. Combine water, ham hocks, and salt. Bring to a boil and reduce to a simmer, partially covered for 3 hours. Remove the hocks and remove the bones, return chopped ham hock meat to the stock. Add the remaining ingredients and simmer for about 1 hour. Makes 8 to 10 servings. We are talking about eggs here, not the weather in Hawaii. Eggs cooked on one side only until the egg white is set but the yolk remains liquid. I grew up with "Adam and Eve On A Raft", two poached or fried sunny-side up eggs served on toast with bacon or sausage on the side. It's a diner favorite from way back. 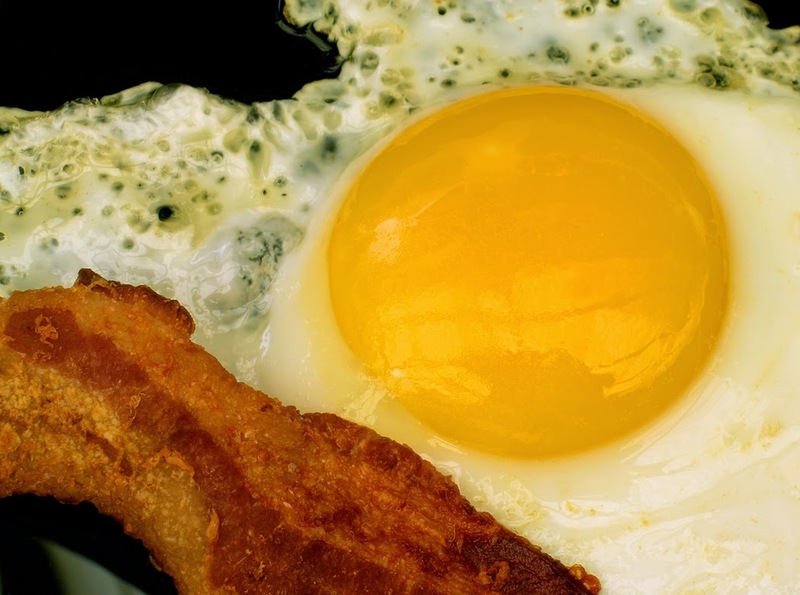 It turns out that folks enjoy eggs sunny-side up all over the world. Here in Hawaii, you'll find eggs served sunny-side up with Spam and rice, or a dish called Loco Moco (recipe below). In Asia, a popular entrée is a fried egg, served over white rice, topped with a dab of oyster or hoisin sauce. The standard fried rice in Thai cuisine is usually topped with a sunny-side up egg. In the Philippines, fried eggs are served in the morning with garlic rice and a choice of breakfast meat such as beef, longaniza, fried milkfish, Spam, or corned beef. In Spain, a fried egg served with boiled rice covered in tomato sauce is called arroz a la cubana. In Brazil and Argentina, a runny egg placed over a steak with a side dish of rice and black beans. In Mexico, huevos rancheros are served with sunny-side up eggs over corn tortilla, covered with spicy salsa, and refried beans on the side. I've even heard of sunny-side up pizza... click here for the recipe. Actually one of my go to sandwiches is a sunny-side up fried egg sandwich with ketchup. You bite into it and the yolk pops and runs down your face. How good is that! By-the-way... if you are on the Hawaiian island of Oahu, in Wahiawa, be sure and stop into a restaurant called "Sunny Side", it's busy their because of the great food! Note about buying eggs – Nearly 4 out of 5 Salmonella-related food borne illness cases share a common vehicle: raw or undercooked shell eggs that were not pasteurized. According to the U.S.D.A., in-shell pasteurized eggs may be used safely without cooking. For example, they may safely be consumed raw (as in raw cookie dough or eggnog) or in undercooked forms (such as a sunny-side up egg). When you buy fresh eggs at your supermarket, check the egg cartons. You're looking for the word "pasteurized". Unfortunately not all grocery stores sell pasteurized eggs... yet! That's where Safest Choice eggs come in. This brand sells pasteurized eggs. To find a store that sells this brand in the U.S. click here. According to this store locator, only Foodland and Times Supermarkets carry the Safest Choice brand in Hawaii, none on Moloka'i. Click here to download a Safest Choice eggs product request form. Fill it out and give it to a member of your grocery store's management team. They listen to their own customers and look for ways to satisfy their needs. It's what keeps you coming back through their doors. When buying eggs, you should also look on the package for – the expiration date. Then remove each egg and look for cracks; germs can enter after pasteurization. Always keep eggs in their carton in the coldest part of your fridge (usually the back of the lowest shelf), not in the egg keeper in the door of the fridge, and be sure to wash your hands after handling eggs. For more information, visit the F.D.A. "Playing It Safe With Eggs" website. I am a big fan of huevos rancheros, and Rosita's Armory Cafe in Salinas, California has the best I've ever eaten. I've tried to duplicate their recipe, and this is the closest I've come to the original. Heat canola oil in a small pan. Add onions and cook one minute, add tomatoes, chilies, cumin, salt and pepper and cook another few minutes. Set aside and keep warm. In another medium non-stick pan, lightly spray the tortillas with oil on each side and heat a few minutes on both sides until tortillas gets crispy and pockets or air bubbles start to form inside. Set aside. In the same pan, add 1/2 teaspoon of canola oil and add eggs, salt and pepper. Cook until sunny-side up or to your liking. To serve, place a tortilla on each plate, top with egg, tomatoes, lettuce, cheese and cilantro. Serve with refried beans and extra fried corn tortillas on the side. Makes 2 servings. Basically these are delicious little egg nests made of shredded potatoes surrounding bacon bits and a egg that is baked for breakfast. My wife likes a little cooked spinach added on top of the bacon before adding the egg. In a large skillet, fry bacon until crisp. Crumble the bacon when cool, and set aside. Bake the potatoes until almost tender (potatoes should be a little undercooked), about 45 minutes. Allow to cool, and then peel and grate them. Season with salt and pepper. You can bake the potatoes the day before and keep them in the refrigerator if you like, but don't use frozen hash browns, they don't work. Spray two muffin pans generously with cooking spray. Scoop 3 to 4 tablespoons of grated potato into each muffin cup. Use your fingers to gently press the sides and bottom in each muffin cup to make a nest (don't press the potatoes firmly against the pan; they should sit lightly in the pan.) Spray again (very lightly!) with cooking spray. Bake at 425˚F for 15 to 20 minutes. Watch and make sure they do not burn. (If they seem like they're not browning, kick up the temp to 450˚F.) Remove when the nests from the oven when they are golden brown. Allow the nests to cool in the muffin pans. Sprinkle half a slice of bacon bits into the bottom of each nest, then crack an egg into each one. Sprinkle with salt and pepper and and a pinch of shredded cheddar cheese. Bake until the whites are set, about 15 minutes. Don't be concerned if some whites bake differently; no two nests will look alike! Remove from the muffin pan with a spoon or fork, garnish each with chopped parsley, and serve with coffee and fresh fruit. Makes 12 one egg servings. This Portuguese brunch recipe is a nice change from the usual eggs and bacon. You will need 2 large ripe tomatoes, preferably from your garden. Cut the tomatoes in halves. Place them with cut side up in an ovenproof dish. Sprinkle with salt and a little olive oil. Then put it in a 375˚F preheated oven for 40 minutes. Mix the garlic, parsley, olives and bread crumbs. Season with pepper. Sprinkle the tomatoes with the mixture. Then sprinkle again with two tablespoons of olive oil. Put it all in the oven for another 15 to 20 minutes. Fry the eggs and sausage slices in a little olive oil. Place a fried egg on top of each roasted tomato and put thin slices of sausage next to it. Surround the tomato and sausage slices with a few watercress leaves sprinkled with lime juice, olive oil and a little salt. Don't forget to grind black pepper and/or dried oregano on top of the eggs immediately before serving. Makes 4 servings. This iconic Hawaiian dish is now eaten from the mainland to the Pacific islands of Samoa to Guam and Saipan. It's a high-carb, high-protein and delicious dish that was originally invented to help cure the hunger of surfers on the Big Island. It’s basically white steamed rice mixed with chopped Spam and green onions, topped with a large hamburger patty and brown gravy, then crowned with a fried, sunny-side up egg. After you have seasoned the ground beef with salt, pepper and onion powder, form them into four patties. Add canola oil to a large frying pan, cook beef patties until they are cooked to your liking, then remove and keep warm. Combine the flour and softened butter and put in the same frying pan over medium heat until the mixture turns pale brown, stirring all the time, then gradually add the beef stock. Stir until the gravy thickens and turns brown in about three minutes. add mustard, and Worcestershire sauce. Taste and season with a dash of soy sauce and Tabasco sauce and salt and pepper if needed. Put a strainer over a pot and pour the gravy into the strainer. Set gravy aside. Fry eggs (sunny-side up or over easy) in butter. Divide hot rice mixture onto four plates or bowls, top with hamburger patties and hot gravy, top that off with the fried eggs. Serve with side dishes of your choice; mac salad, fried saimin, or perhaps just a big slice of orange. Makes 4 big serving. In Asian cuisine, particularly in sushi, raw quail yolks are separated from the whites and placed atop different Gunkan-maki sushi. Gunkan-maki sushi is a ball of sushi rice surrounded by a strip of seaweed with flying fish roe, salmon roe, or sea urchin, and a raw sunny-side up quail egg yolk on top. My favorite sushi ever! Before anything else, separate the whites from the yolks of your quail eggs. Discard the whites. Take a half a handful of rice, roll and shape it into a oval shape that's approximately 1 1/2 inches in height and 2 1/2 inches in diameter. Make sure that it's tight enough so your base doesn't fall apart and is sturdy enough to hold some weight. Wrap a strip of nori around the rice cylinder, leaving roughly 1/2 inch of empty space at the top. Fill half of that space with a spoonful of Tobiko, and the other half with a fresh egg yolk, or create a nest of Tobiko on the top and place the yolk in the middle. Makes 4 sunny-side up Gunkan-maki sushi. Gyu means beef in Japanese and don means rice bowl (with something on top). In other words, beef rice bowl. Basic gyudon may be topped with beni-shoga (pickled ginger), sliced negi (shallots/spring onion) and is also delicious as Tsukimi Gyudon with a raw egg on top. The raw egg yolk adds a creamy element to the flavor, similar to sukiyaki. Place water, dashi powder and onions in a saucepan and boil 3 minutes. Add sugar, sake, soy sauce, beef, and stir to combine well. Bring to the boil and simmer for 10 minutes. Stir in freshly grated ginger and simmer another 5-10 minutes until beef has absorbed the flavor, and the liquid is reduced to half. Serve on a bowl of steamed rice and top with beni-shoga (pickled ginger), and a raw egg. Makes 4 servings. Tsukimi udon, or "Moon-viewing udon" is named for the raw egg that's placed in the bowl as this Japanese dish is served (the egg poaches in the hot broth). It's comfort food that's full of wonderful goodies. To make the broth, bring the chicken stock, soy sauce, sesame oil, and ginger to a low simmer for 3 minutes. To cook the noodles, prepare the udon according to the package instructions (typically a couple minutes). Drain the noodles and divide them evenly between two bowls. Add the shrimp, beet tops, tofu, and mushrooms to the broth and cook until the shrimp turns pink, approximately one minute. Pour the broth over each bowl and divide the cooked ingredients among them as well. Top each bowl of udon off with a raw egg (the egg poaches in the hot soup), scallions, and sesame seeds. You can also drizzle a 1/2 teaspoon of sesame oil over the egg and a little bit of garlic chili sauce for added spiciness. Makes 2 servings.